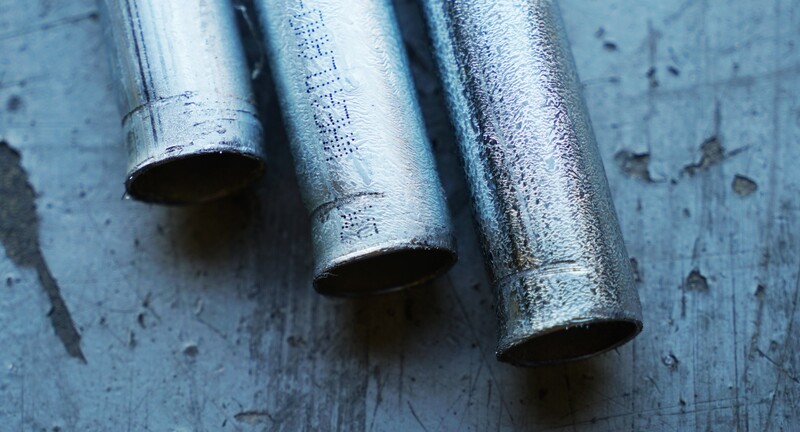 Electrical Metallic Tubing (AKA EMT, electrical conduit, thin-walled steel tube) is widely used throughout the world for routing and protecting electrical wiring. EMT is not rated for structural use. 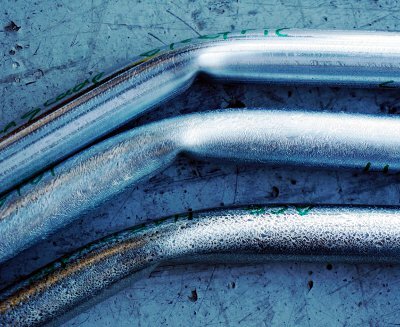 Despite this, it is well suited for structural purposes being light-weight, strong, corrosion resistant, easily formed, and easily welded. Because information on the structural properties of EMT is difficult to locate, Tryop has undertaken a study to establish the general mechanical properties of EMT for use in load bearing. EMT is sold in inch trade sizes. From these sizes, Tryop selected the 3/4" trade size (0.92" Outside Diameter) as having the most experimental value, as it is a comfortable size for gripping, and thus suitable for human-interface mechanical structures. Tryop ran a mechanical buckling simulation in ANSYS, which resulted in the following simulated ultimate load results. Our engineers found these numbers to exceed intuitive expectations. Therefore a physical test was called for. Three samples of EMT were procured from three separate local suppliers. They were all cut to 24 inches long from the end of 10 foot segments. The samples were measured. The OD was consistent between 0.921" and 0.928". The wall thickness was consistently 0.048" to 0.050" at the stock end, and 0.042" to 0.045" at the cut end. This difference is suspected to be attributable to galvanization buildup on the ID of the exposed stock ends. The three compression tests were carried out on a NIST traceable material testing machine, calibrated at +- 2 lb on a range of 0 to 20,000 lb. One end was constrained, while the other was left free, and loaded with an offset force to induce buckling. All three samples buckled in the same location, in the same mode, and within 100 lb of the same ultimate force (4200 lb). 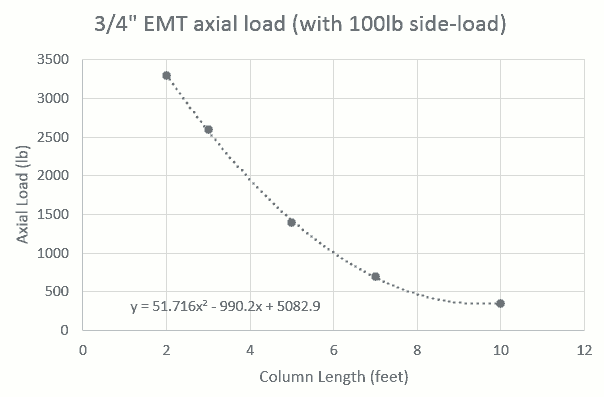 The simulated failure force for a two foot long segment of 3/4" EMT is 3300 lb. As the actual ultimate failure force was found to be 4200 lb, the simulation appears to have a safety factor of approximately 1.3 for ultimate force. We therefore intend to use the simulation results as representative of actual ultimate failure loads, and design accordingly. Tryop is supported with thin margins.